Coolers, which are insulated storage containers that keep your food and drink cool and fresh, are essential in every camping trip that you do. Most of you just bring one cooler with you on your trip, with foods and drinks carelessly tossed in with some ice, only to find them all water-soaked and soggy. As you should know by now, properly packing a cooler is more than just tossing in ice and then the food and drinks right after. It’s all fun and games until you are all left with eating some questionably refrigerated food or scrambling around trying to find more ice to put inside the cooler. 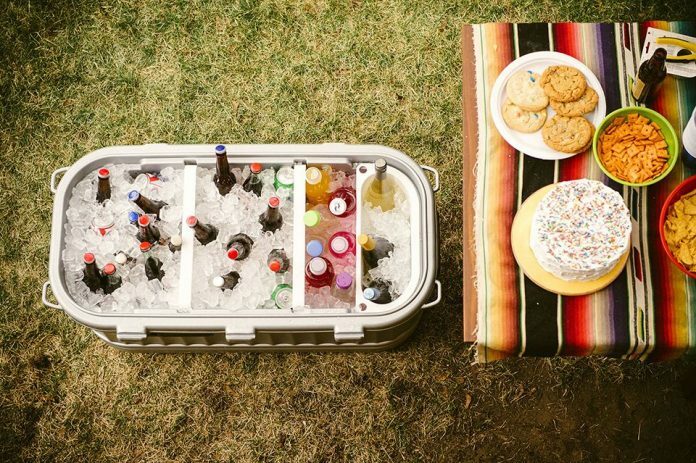 Therefore, to be able to keep your food and drinks cool for a longer period, it is vital that you learn the techniques on how to properly pack a cooler like a pro. Keep on reading if you want to know more. What Are the Different Types of Coolers? Plastic coolers are the most popular type of coolers due to their resiliency and durability. Generally, these coolers have the capability to hold a large number of items in them while giving you the option to easily transport them around, thanks to its handles and wheels. Modern versions now come with compartments for your ice packs, as well as a valve found at its bottom, allowing you to drain water after the ice has melted. While metal coolers are very durable, these are commonly unnecessary unless you are planning on doing high-impact activities. In addition, these are also quite heavy, making them burdensome to bring along on a camping trip. As the name suggests, these coolers are made of Styrofoam boxes that you can fill with ice or ice packs and are equipped with removable lids. These are lightweight coolers but not as durable and long-lasting as the plastic coolers. Also known as insulated cooler bags, fabric cooler bags are the smaller and more convenient version of a traditional camping cooler. These are usually made from synthetic fabric that comes with cooling packs. While these may be ideal if you plan to trek to your camping site by foot, these may not be able to keep things cool for a longer period. Electric coolers are normally plugged into your vehicle and they work just like a mini-fridge. Bringing this type of cooler along may not be ideal for every camping trip. However, if you plan on staying out for a longer period or if you have the battery power to keep it juiced up, then this one may be just what you need for your camping trip. Bring the cooler inside. If you are storing your cooler in a hot shed or attic, or even in the garage, you need to bring it inside your house at least one day before your camping trip. The reason is that you would want your cooler’s core temperature in its coolest state. Clean thoroughly. In case you did not get the chance to clean your cooler thoroughly from the last camping trip, take a moment to wash it using a disinfectant spray. After all, one of the most effective methods to improve food safety is to make sure that your cooler is squeaky clean. Pre-chill. To effectively lower your cooler’s core temperature, fill it with cold water and add a bag of ice at least 12 days before your camping trip. Dispose of the ice water before you start packing your cooler. Prepare your food. To be able to save much more space, you would want to prepare as much food while you are still at home. With this, you might want to consider pre-chopping your vegetables, as well as prepare the marinade ahead of schedule. You may also portion out the condiments into smaller containers if you don’t need to bring the whole bottle. Remember that the less space your food items take up inside the cooler, the more ice you can keep. Remove excess packaging. The food item’s original store packaging could take up a lot of space. For instance, you do not need to bring the whole tray of eggs if you only need 6 of them. Transfer food to leak-proof containers. Removing the store packaging is advisable, as there’s a chance you will not be able to reseal it. With this, you must assume that everything inside the cooler will get wet. Unless you want your food floating around with your beer cans, we do recommend that you transfer some of them into reusable containers. Freeze. For extended trips, you would want to freeze your food prior to hitting the road. While you are not required to freeze the food that you are going to eat on the first night, it is recommended that you freeze food that you will consume later on. Last item to prepare. The last thing you should do before you walk out the door is to pack your cooler. Doing this will allow you to efficiently use the very limited time your cooler actually works. Place block ice at the bottom. Start by placing a layer of block ice then the food items, in reverse order. You may also begin placing the food you are going to consume on your last day and then work your way up. Place ice cubes in between. In case you didn’t know, air is the number one enemy of ice inside your cooler. To avoid ice melt at a rapid pace, you might want to fill up spaces in between with ice cubes. Position liquids vertically. As mentioned earlier, you must assume that everything in there will leak. With this, you must ensure that all liquids are positioned vertically. Categorize your meals. To avoid searching all over your ingredients, try placing breakfast foods on the left side while placing the dinner foods on the right side. While the steps mentioned above are fairly easy to follow, we advise you to take note of these tips. Here are some of our suggestions for you to be able to maximize your cooler’s efficiency for a longer period. When you load your vehicle, keep in mind that the cooler always stays inside. To add, avoid placing it on the trunk, where it is vulnerable to overheating. Keep the cooler shaded at the campsite. Obviously, you would want your cooler to avoid getting hit by direct sunlight. You may also place a wet towel at the top to help it insulate further. Always keep your cooler closed to keep its contents cool for an extended period. It has also been scientifically proven that it would be better to just leave the meltwater in the cooler than draining it. You may want to consider buying a small food thermometer and placing it inside the cooler, in case you want to know what’s going inside it. You may also consider using reflective paneling on top of your cooler to prevent it from getting hot due to direct sunlight. You should also consider bringing a separate cooler for your drinks. After all, the cooler loses its cold temperature every time you open it to get a drink. For food preparation, it is advisable that you seal your food items inside waterproof containers to be able to keep it uncrushed and dry for an extended period. To keep the cooler cold for a longer time, keep it full as full as possible. Carelessly packing your cooler might just lead to wasted food, which is the last thing you would want especially if you are out on a camping trip, with no source of food and drinks but the ones you have prepared back at home. With this, we recommend that you follow the abovementioned easy-to-follow instructions so you will be able to keep your food and drinks cool and fresh for a longer time. In addition, we highly suggest that you take note of the tips we have mentioned, as it will increase your cooler’s effectiveness during your camping trip. Now that you have read this post in its entirety, we do hope that you will be able to apply this new knowledge before you set out to your outdoor adventure.